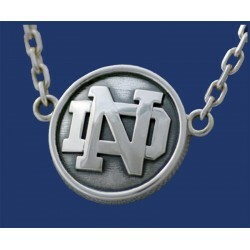 Custom ND Reversible Tags, Leprechauns with ND Logo and many other styles to chose from. 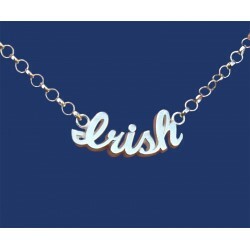 Shop Online Notre Dame® Fine Jewelry ND Neclaces, Custom Gold in 14k or Sterling Silver ND Custom Necklaces. 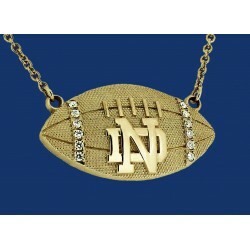 Custom designed ND Football Necklaces with our famous ND 14kt Gold Striped Football with Diamonds, all Made in USA. The cable link chain has a two-sided tag. One side has the recessed ND logo and the other side has the recessed leprechaun. Available in 18" & 20" lengths. Allow 2 to 3 weeks for delivery. The stripes in the 14kt gold football pendant have approximately a 1/4 ct. of diamonds. The football from end to end is 1 1/4" in length. The 14kt gold cable link chain attached to the football is made so it can be worn at either a 18" or 20" length.Sharp 3 dimensional detail on football. Allow 2 to 3 weeks for delivery. Can be engraved on the back.Available in 18" & 20" lengths. Allow 2 to 3 weeks for delivery. Sharp 3 dimensional detail.